POWER Injector onto Ethernet Cable. Makes it so you can Run a DC Transformer on an Ethernet Line. These adapter Allow you to Inject and Take off Voltage over the Ethernet Line. One cable (the injector half) has a Ethernet plug and port and a 2.1mm jack. 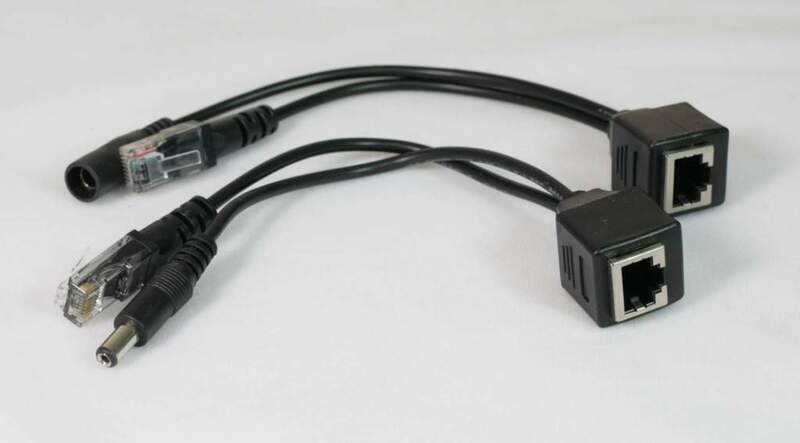 When you plug in a power supply (say a 9VDC wall adapter), the injector merges the power adapter in so that pins 4 and 5 connect to the power adapter ground and pins 7 and 8 have the positive 9VDC. The other cable (the extractor half) does the opposite, splitting off pins 4,5 and 7,8 and bringing them to a 2.1mm DC barrel plug. You can then use the DC plug to power your projects as if it was connected directly to the wall adapter. VOLTAGE DROP ACROSS ETHERNET CABLES. Note that Ethernet cables, especially long ones, will act like resistors as you get past 10 meter spans. Most Ethernet cables are 24AWG, 0.085 ohms per meter (0.026 ohms per foot) so if you want to draw say 500mA from your adapter, there will be a 1 Volt drop for every ~25 meters / 80 feet. WARNING POE is a 48VDC System. Power-over-Ethernet standard that allows devices and routers to activate a 48VDC power line on the unused Ethernet pins (4,5 and 7,8) but PoE is expensive, requiring a special router and then a step-down converter to handle the high 48V line.